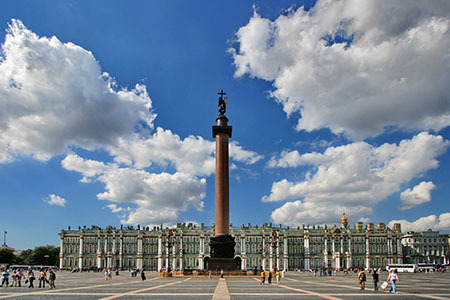 Please contact us right after you booked the tour by email tours@st-petersburg-visit.com to prepare visa-free documents. It is important to arrange them in advance. 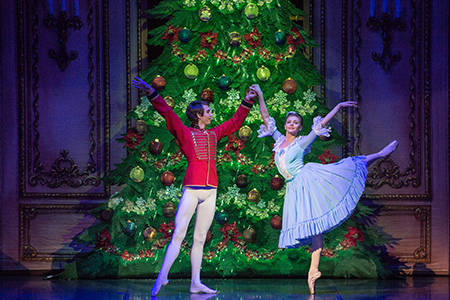 The tour start for Helsinki and Tallinn will be given by email as well depending on what time you cruise moors. You can change the sequence of tours, just let us know when you book one. All tours in the cities are group tours. In the Hermitage, the Impressionists collection is not included in the regular price. This tour is made for cruise travelers who already booked their cruise voyage and want to take local tours separately. You have a chance to get an alternative and affordable tour programme while cruising the Baltic region. This itinerary includes Russia, Estonia, Finnland classic tours and you can take them in order your ship is staying in each place. We customize the tour sequence depending on your ship itinerary. In St Petersburg, you will have all the best in one day: The Hermitage Museum Tour and Peterhof Fountains tour by Hydrofoil. The Hermitage Museum presents exhibits of almost any culture found in the world. It is primarily known for its Western European art collection including works of world-famous artists such as Leonardo da Vinci, Titian, Rafael, Diego Velasquez, Michelangelo, Rembrandt, Rubens, and many others. The Hermitage Museum tour starts at 9:40, lasts for 3 hours and you will have a professional guide. It is a small group tour so you may be part of a group but not more than 10 participants in each. At 14:30 starts the Peterhof by Hydrofoil tour with a licensed guide. On the Neva river embankment, you will hop on a hydrofoil and ride straight to Peterhof through the Gulf of Finland. In Peterhof, you come ashore and walk in the gardens and see all the fountains: the Grand Cascade, the Bath House, the Catherine Block, Monplaisir Palace. In Tallinn, the tour starts in the port when your English-speaking local guide meets you by the cruise ship and you drive to the city center. 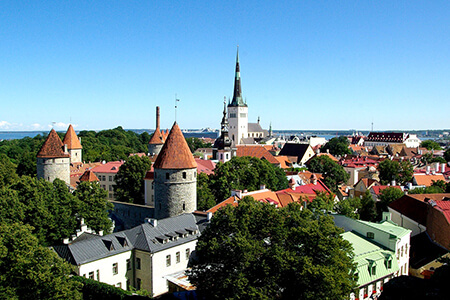 You will see the famous Tallinn highlights: ST Olav’s Church, The Three Sisters Houses (a modern five-star hotel), Town Hall Square, Toompea castle, the Estonian Parliament, the Cathedral of ST Mary (Dome church) and Alexander Nevsky Cathedral. The tour lasts for 3 hours plus 2 hours free time. It is a group tour. 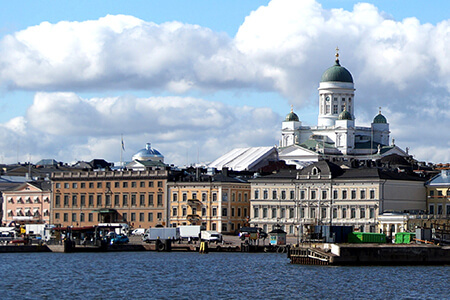 In Helsinki, you will drive to the city center by public transport which is included in the price. 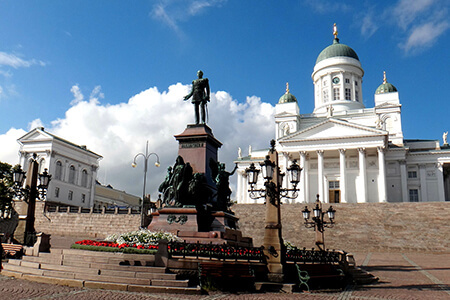 On a walking tour, you will see the Presidential Palace, the National Museum and Finlandia Hall, Opera House, Finlandia Concert Hall, Uspensky Cathedral and the Parliament Building. You will see the famous Mannerheim Street, the city central avenue, which is also the main city shopping area. The tour lasts for 4 hours plus 3 hours for transfer. You always have a chance to change the sequence of cities to visit depending on your cruise itinerary.